Great sneak peak! I love the aqua/orange combo. Also, what a great scrap space you have..it is so clean and organized.. These kits seem so colorful. Love all the colors on your sneak. Great scrap room. Love the washie tapes in colors of rainbow! That washi holder is awesome-and I love the bright, happy sneak! Love the sneak and wood veneer. Thirty one makes great and oh so pretty storage! Love all the 31 products you have!! Lovely sneak peak, I can't wait till Monday! Great sneak! Love those wood veneers, and loving your great collection of roller stamps! j'adore ces couleurs!! trop belles! The chevron bin is fantastic! I love the wooden @ and the 2! What a great idea with that washi tape holder! Great sneak! I love all of your Thirty-one storage & the washi tape holder! I may have to create my own washi tape holder after looking at yours! Good call recycling the block spools from the kids! Just goes to show that no space is too small to be creative. I would love to try out the washi tape! I see a wood veener alpha-SC Darling Dear perhaps? Great sneaks, I love the tin pins-are those gonna be in the kit? Love all of the flair that I am seeing in these sneaks!! Really love that bin under your desk! Love the flair and I love your washi "dispenser", great idea. I love the flair and wood veneer sneak peek! After seeing your washi tape it makes me want to add some more to my washi collection,lol. I love the Flair and wood veneers! 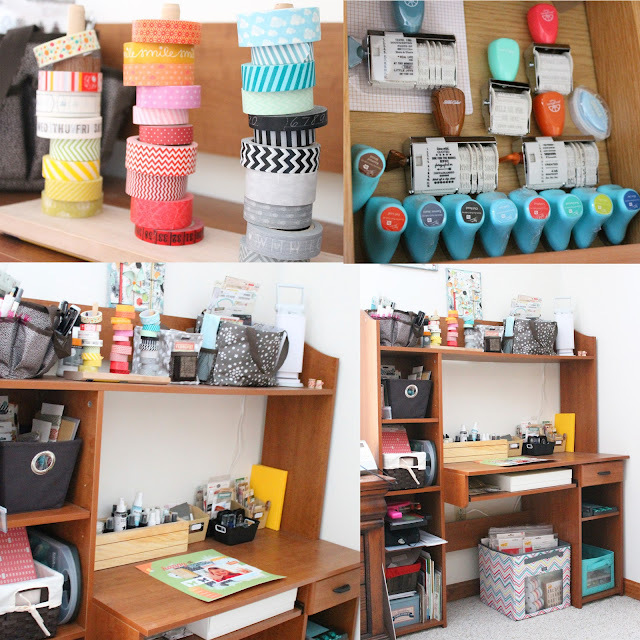 Lovwe how yu store your washi tape! Brilliant idea! Your space looks great and I love your washi holder! I love how you store your washi tape! Wonderful scrap setup! I am loving your sneaks! I love how completely organized it is, and so compact! Such a fun scrap space. Thank you for sharing! I enjoyed every every picture. Thank you for being so generous.